With the loss of so many community leaders, and everyday life resembling little of how it was before, there have been opportunities for strong characters with leadership qualities to come to the fore. Water supplies are at issue in much of tsunami-hit Aceh, especially as ground water has been contaminated by the sea. “Water is an example of why women’s views must be taken into account during reconstruction, says Gia, 26. 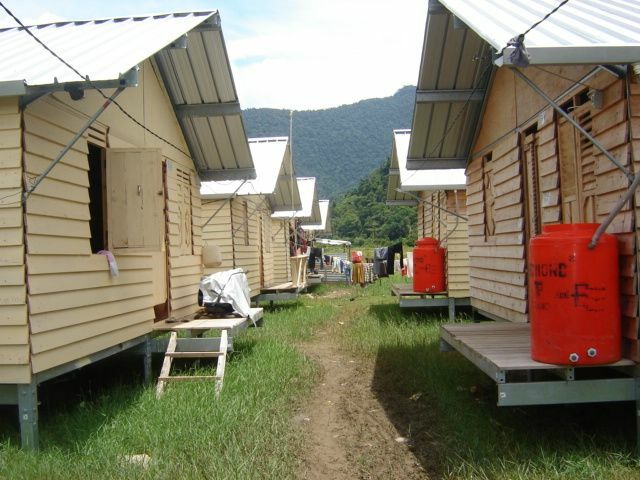 Australia (AusAID) is providing AUD 40 million (about US$ 32 million) to assist the Acehnese in building strong governance and re-establishing village communities. Two hundred community facilitators like Gia have received training in leadership, problem solving and negotiation. This unique programme, to ensure that the tsunami-devastated communities of Aceh got their views heard in the reconstruction process, is being funded by the Australia Indonesia Partnership for Reconstruction and Development (AIPRD). Village facilitators, often survivors themselves, have been carefully chosen and trained to help people lobby government and donors. Women’s empowerment is key. The views of women are especially vital but in today’s Acehnese society women sit separately and often stay silent in meetings where men are present. To address this, half of the 200 facilitators are female as are most of their trained assistants, known as cadres. 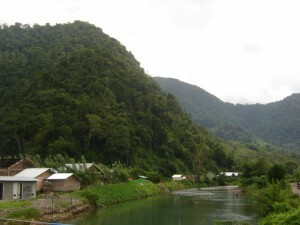 The village Gia was assigned to, Meunasah Lhok, in the district of Lhoong, has recently relocated from beside the sea to a safer spot at the foot of mountains. During 30 years of conflict between the GAM rebels and the Indonesian army, which ended in 2005, this was a rebel area. It is a beautiful verdant setting, served by clean water from a river descending from the hills. a child is playing in the river, watched by his mother. There are rows of smart, new wooden houses on stilts, decorated with flowerpots. There are separate shower and toilet blocks and communal areas to wash clothes. If you didn’t know better, you would think it a contented place. As I wade through long grass and mud (it has just rained) the loneliness is tangible. Only 100 people live here – 200 more died. Most of those who survived were away when the tsunami struck. Now many of them live in their new huts alone – most unnatural for Indonesians, who are accustomed to being in large family groups. Work is now hard to find locally for this traditional community of fishermen and farmers – their fishponds and farmland contaminated by seawater. Much of the time they are away in Banda Aceh or picking up what they can along the coast, employed in various reconstruction projects. It takes Gia an hour and half to get there by motorbike, along the temporary unmade road from Banda Aceh. Children on their way to and from school run and wave until she stops to give them a ride. She’s had to deal with punctures and tumbles and she jokes that she always arrives covered in dirt and with lungs full of dust. The villagers did not take to her at first – she is a strong character with, to them, a strange accent. The daughter of an Acehnese, she left as a schoolgirl and studied in the city of Medan, just over the provincial border in north Sumatera. “My father wanted a son and brought me up as a boy. 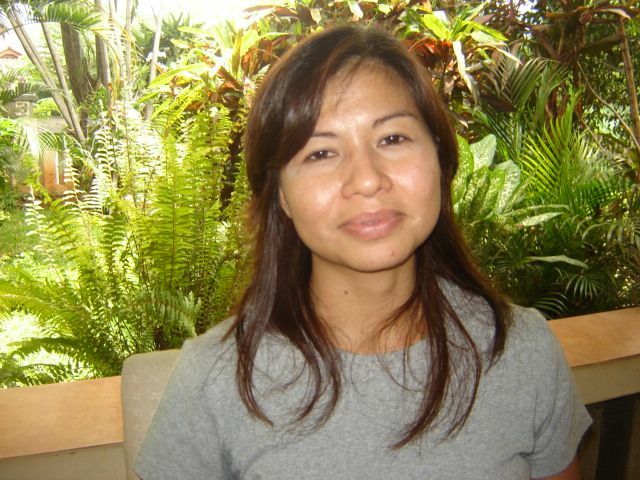 He always encouraged me to speak up.” She returned to Aceh to join the relief effort. To win people over, Gia endured the same harsh conditions and lived in a tent just like everyone else. However there were more shocks in store for them. Just as people were moving out of their tents and into their new permanent homes, calamity threatened again. After heavy rains, torrents of water were descending from the hills and threatening to flood them. The only bridge, newly constructed by an American team, was damaged and villagers feared it would be rendered unusable. As it was their only route onto the road this would be disastrous. Gia waded waist high through water until she found a motorbike. She rode 10 kilometers along the rocky, temporary road and persuaded the American team to bring out their heavy equipment. They repaired the bridge while she lamented the loss of her AIPRD raincoat, which had been washed away. We talk inside the hut belonging to one of the village cadres, Darmawi. He is the one on whom she relies the most. In his new one-roomed hut, we sit on the floor to chat. The mattress is propped against the wall. There’s a single burner stove in one corner, a frying pan, and a broom. Jeans and t-shirts are tossed across a line. In the early days, he saw Gia as the means for him to look beyond his own tragedy. He happily tolerates what would seem to some men bold behaviour. As we chat, Gia lights a cigarette. It is highly unusual for women here to smoke. Moreover, it is the fasting month. I raise my eyebrows and she grins and explains she has dispensation from all the fasting rules because she is menstruating. Darmawi explains how the cadre training gave him confidence. “I learned how to negotiate,” he says. “First I went to our old village chief and suggested to him that he could take a rest – it was time for the younger men to take on this hard work. He then asked the government agency responsible for tsunami reconstruction, the BRR, for money. Once they’d agreed, rebuilding could then begin. Encouraged by Gia, villagers have formed self-help groups and with money provided by NGOs they are starting small businesses. Gia would concur with the widely held view that women in Aceh have long been considered more outspoken than their sisters in some other Indonesian provinces. “The Acehnese are traders. For generations they have had to sell their wares by being forthright and shouting,” says Professor of Humanities at the University of Indonesia, Gadis Arivia,(pictured, right) who spent holidays in Aceh with her grandmother during the 1980s. Recently she has been a guest lecturer in women’s studies at Syiah Kuala University in Banda Aceh. “During the conflict between GAM and the Indonesian army, women as well as men were victims. They had to take on extra responsibilities because their men were dead. They had to earn money and bring up their children alone. In 2002, sharia law was introduced. It became compulsory to wear the jilbab. Women could go out after dark only if accompanied by their “muhrim” – a male relative. “Many women now will tell you their role is to stay at home and raise their children. Of course, the poor continued to work because they had no choice and the tsunami further changed circumstances. Professor Gadis and her team from the University of Indonesia visited Aceh in March 2005 to survey how women and children were faring in temporary barracks. Two hours up the road from Gia’s village, in Ruyung, west of Banda Aceh, is Dewi, 23. She worked as a children’s counsellor until she joined the facilitator programme. At first, when she was collecting information about the survivors, she realised that they were so wary of what she would do with it that they wouldn’t tell her the truth. AIPRD recently provided an infrastructure grant to Ruyung and Dewi’s role was to help the community decide how to spend it. After rigorous meetings they drew up a list of priorities. “My training – both as a facilitator and before that as a counselor – enabled me to show them the alternatives and the possible results. In the end they chose to build a bridge to replace the one that was severely damaged in the tsunami. With the loss of so many community leaders, and everyday life resembling little of how it was before, there have been opportunities for strong characters with leadership qualities to come to the fore. One of those is 19 year old Ermalisa, who lives on the coast at Paya Kaneung, 40 kilometers west of Banda Aceh. Her mother had drowned as the family crossed a river to safety. Ermalisa took over the care of her 3 younger siblings and her father. The village elders spotted that she had the qualities to inspire and voted for her to be a cadre. In a meeting with older cadres and the village chief, she is not afraid to voice her opinions, even interrupting them. “The training course forced me to speak in public on different topics. I am far more confident,” she explains. She has focused her energies towards her peer group. She feels there’s not enough to occupy teenagers and children in the village. During Ramadhan she was busy organising games and competitions. Her village facilitator had arranged a computer course for youngsters and she used her new skills to write letters to NGOs asking for money for prizes. She’s now also using the computer to help her as she studies to be a teacher. The man responsible for the facilitator and cadre program is Lalu Suhaytman, of AIPRD. He designed the training and took part in the recruitment. Women formed a micro-credit collective which men were not allowed to join. Professor Gadis acknowledges that the facilitator and cadre programme is positive. Lalu is planning to extend the facilitator and cadre programme. Another 1,500 cadres will be trained before the end of the year. How does someone who loses everything and everyone they have loved — in a few minutes — continue with their life? The most remarkable aspect of my work as a feature writer for the AusAID reconstruction programme in Aceh was meeting people who were emerging as leaders, managing to think about the future, having ideas. 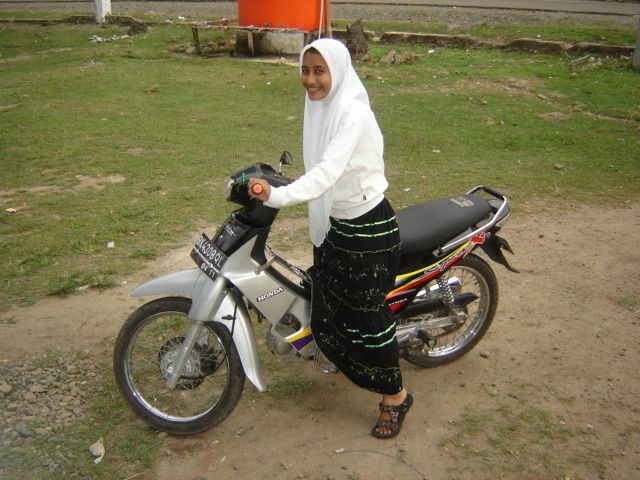 In one village, one of those leaders was a 19 year old girl (see my feature: Women of Aceh Find their Voices). And in the run-up to the first elections for governor and deputy governor in Aceh, tiny tsunami-hit communities organised their own local elections to international standards. says Khusnun, the election chairman for the village of Kareung in the sub-district of Lhoong, a former conflict area 55 kilometers from Banda Aceh. Kareung is now a tiny community of 140 – a third of its original size. 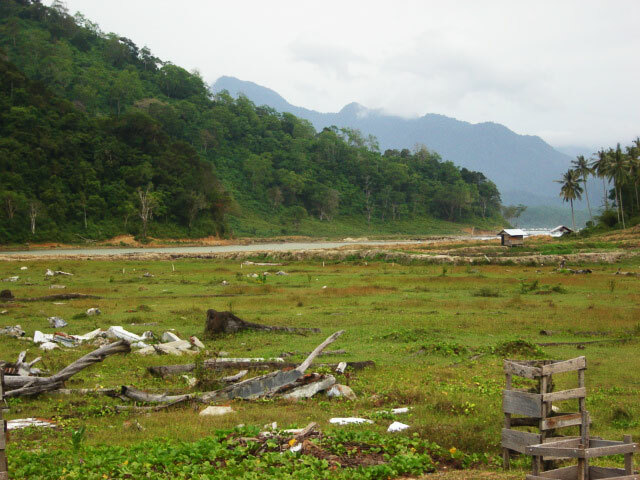 Most of the residents are men who were away when the tsunami struck. The mosque was the only building to survive and became a potent image. Khusnun, 45, is a man of extraordinary resilience. He had been away with his wife, returning to discover his entire extended family had perished. As a school principal, he also lost more than half of his pupils. First, he turned his attention to rehousing those villagers who remained. He raised funds from an NGO to enable the villagers – mostly farmers and fishermen – to buy a disused clove plantation in the mountain foothills. As you approach their temporary settlement, it looks colourful and bright, a contrast to the still devasted landscape surrounding the mosque a kilometer away. There are gardens stocked with flowers, fruit and vegetables all surrounded by fences to protect them from the goats. Further up the mountain they are planting chilli and peanuts to compensate for the lost rice paddies. It’s now a mainly village of men – those who survived were away for the day. Khusnun’s temporary home is comfortable. A photograph of his two daughters, now dead, is on the wall. There’s a large radio in the corner. A neighbour nurses her new baby in an adjoining room as he sits with his colleagues from the election committee on the floor. Khusnun is a veteran of three elections for village chief, or geuchik. “The difference this time was in our planning and the look of our ballot paper. These were ideas we got from our election workshop,” Khusnun says. He came up with the idea of a workshop when he discussed plans for the election with Kareung’s “community facilitator”, Badlisyah. 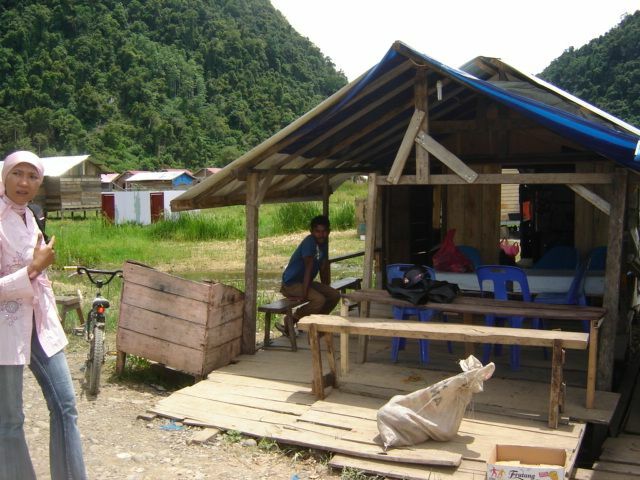 Badlisyah, 22, had been living and working in the village for about six months, as part of a program called LOGICA – the Local Government and Infrastructure for Communities in Aceh project. His role has been to help traumatized people to identify and decide what they will need when their villages are rebuilt. He then works with them to lobby aid donors and the government so they have well-planned homes and utilities. LOGICA is sponsored by the Australia Indonesia Partnership for Reconstruction and Development (AIPRD) and is staffed almost entirely by Acehnese. Australia is providing AUD 40 million (about US$32 million) to assist the Acehnese in building strong governance and re-establishing village communities. Two hundred community facilitators like Badlisyah have received training in leadership, problem solving and negotiation. Hundreds more villagers have trained as their cadres, or assistants. There have been grants to fund smaller projects which nevertheless help a community get back to normality, such as building fences, bridges, roads and village halls. 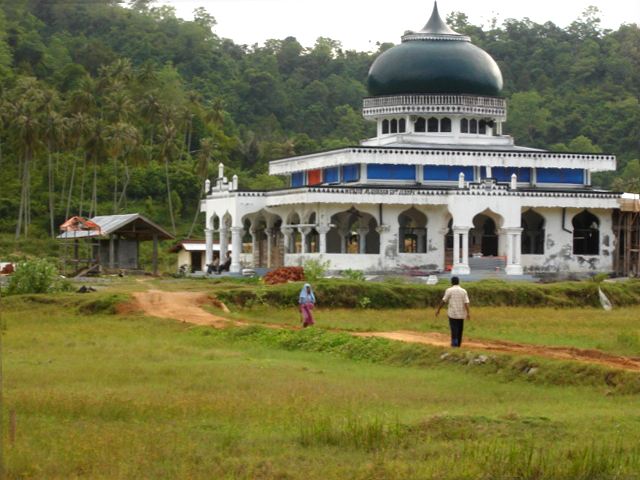 LOGICA has two other major programmes in addition to its communities project: it is re-establishing land ownership through land mapping (carried out by Acehnese engineering and architecture graduates) and spatial planning; and it is strengthening sub district governments by building completely new offices or providing equipment and training. The community yearned to move forward but for a while they couldn’t see how. 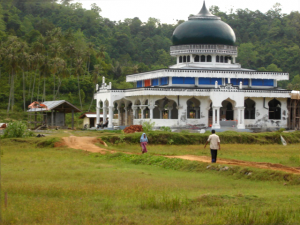 Badlisyah was a chemistry student at IAIN – Institut Agama Islam Negeri Ar-Raniry, or the State Institute of Islamic Studies, before the tsunami. He too was a survivor, sheltering in a mosque while his family was saved by hanging onto trees. In his discussions with Khusnun about an election, he drew on his own experience of student democracy. 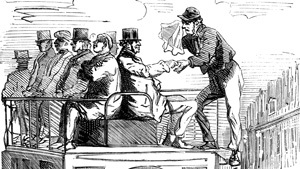 The two men approached LOGICA for information. The upshot was a seminar organized by LOGICA’s local governance adviser, Mohammad Najib, with the sub-district head. Representatives of four other villages who were planning elections also attended. They saw examples of polls in India and Pakistan, and went into detail about the Indonesian electoral process. They looked at different types of ballot papers and counting methods. During detailed discussions villagers decided which methods would work best for their particular circumstances. “For the count, the sub-district suggested having a box for each candidate. People would put their ballot papers into the box of their choice,” says Khusnun. The Kareung election committee went away and nominated three candidates who had to prepare manifestos and take part in a debate. The eventual winner, Salahuddin, a 28 year old construction worker, admits to having been apprehensive and surprised. “They turned up at my house one evening and asked me to stand. They said they wanted me to prepare a speech and take part in a debate with two other candidates. “I was nervous on the day but I’d reached the point of no return so I just did it. The community say they chose Salahuddin because he has been active in the reconstruction and rehabilitation of their village. The son of a religious leader, they see him as honest and dedicated to their welfare. Before election day, all voters received an invitation letter which they took along to the polling station. When they collected their ballot paper they inspected it with a member of the election committee to ensure it was clean and unused. On the back of every ballot paper were official logos and stamps to allay any fears of fraud. Separate polling booths were protected by curtains for privacy. Voters punched the photograph of their favoured candidate with a nail, folded it and put the paper in a box. 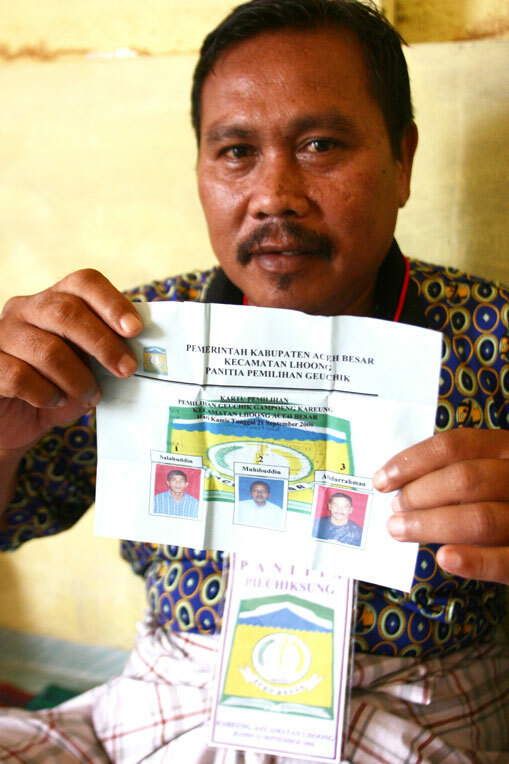 The head of security for the election, Mukhtar, only just had time to vote before he was called away – his wife had gone into labour in Banda Aceh! But the procedures he’d put in place prevailed on the day. “The counting was no different from the House of Representatives,” says Khusnun. “Before we opened the box we asked the candidates and people present if we needed more time, as some students who were away in Banda Aceh hadn’t been able to get here. Once the majority decided we should proceed, we unlocked the box. Of the 87 registered voters, 69 took part in the ballot. Salahuddin was the clear winner, with 40 votes He formed a community forum to choose the village secretary and other leaders. The secretary’s post was filled by one of the other candidates, Abdulrahman. “Both Abdulrahman and my other opponent, Muhibuddin , are strong characters with leadership qualities. They could fill several different posts,” says the new geuchik. The committee will shortly receive training from LOGICA in all aspects of village administration, from letter writing to filing. Salahuddin, who lost 36 members of his family in the tsunami, is looking ahead. “In five years time, when my tenure is up, I want to see roads restored and in good condition. Khusnun will be concentrating on his school. “I lost six of my teachers. Two others who live in Kareung have joined me and I have recruited young graduates. The young community facilitator is full of admiration for these two men who have faced down catastrophic loss. The new village chief lost 36 members of his family that day. Indeed, already there have been 4 elections organised by communities who attended the same workshop. He is passionate about what has been achieved. A version of this story appeared in Tempo Magazine, Indonesian Time, on December 4, 2006.